[This is in reference to a popular U.S. television show that features outlandish, shocking and crude behavior and personal revelations from the guests who are supposedly the "man in the street". The more outrageous, the higher the rating. - Ed]. These are just the opposite of the qualities that Islamic spiritual life encourages. What I saw in Kuwait (for example) were quiet, dignified, respectful, self-respecting, cultured behavior among Muslimaat. Social relationships were very family-oriented and female-centered. Kuwaiti women socialized within their families and with other women as a priority. 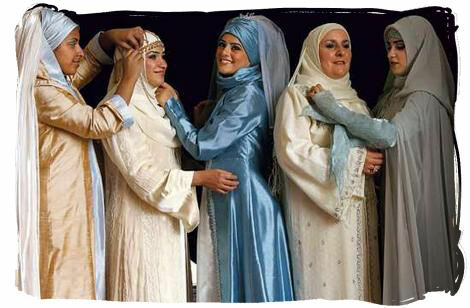 How should a Muslimah Treat Her Sisters In Islam? So this is not love for the sake of status, notoriety, or fame. It is a love that requires a clean heart, a light heart, a soft and pliable heart. This kind of love is the only way to eliminate hatred, jealousy, and rivalry from peoples hearts. The importance of kindness is mentioned hundreds of times in the Qur'aan! Islam instills in its followers the characteristic of kindness and faithfulness towards one’s friends, including the parents of one’s friends. The seerah is filled with examples of kindness and faithfulness among the early believers. If you remember the story concerning our mother ‘Aaisha (radiallahu ‘anhaa) who used to become upset with Rasoolullah (sallallahu ‘alaihi wa sallam) because he used to extend himself to the friends of his late first wife, Khadijah (radiallahu ‘anhaa). He (sallallahu ‘alaihi wa sallam) spoke highly of Khadijah (radiallahu ‘anhaa) and sometimes he would slaughter a sheep and send a large portion to Khadijah’s friends. The act of smiling actually stimulates the secretion of certain chemicals (endorphins) that increase our sense of well-being. Furthermore, our beloved Prophet (sallallahu ‘alaihi wa sallam) said: “None of you truly believes until he likes for his brother what he likes for himself” [Agreed upon] It is impossible to do this without sincerity. Arguing leads to further misunderstanding, rigidity, and is an easy opening for Iblis; hurtful jokes often lead to hatred and loss of respect; and breaking promises upset people and destroys love. We need to learn to be able to “back off” to not have the final say, to sometimes just “agree to disagree” until the matter can be resolved by someone with more knowledge. The kind of posturing and gesticulation that poisons so many disagreements is leftover jahl (ignorance). We need to run away from this.